Agricultural exports account for a significant share of Indias total export basket. During the triennium (hereafter referred to as TE) ending in 2000, exports of agricultural products accounted for about 12.8 percent share of total exports from India (Table 7). Although the share of agricultural exports in total exports has fallen from 19.5 percent during TE 1988, foreign exchange earnings from agricultural exports have increased significantly. Foreign exchange earnings from agricultural exports increased from US$2.3 billion in TE 1988 to US$3.2 billion in TE 1994, and further to US$4.9 billion in TE 2000. Thus, the total value of agricultural exports exhibited a higher growth during the period between TE 1994 and TE 2000 as than with the growth recorded between TE 1988 and TE 1994. The actual value of agricultural exports in TE 2000 was about 17.7 percent higher than the extrapolated trend value based on 1985-1994 exports. Imports of agricultural commodities in contrast constitute a relatively small proportion of total imports, and their ratio to agricultural exports has also decreased during the period analysed here. The share of agricultural imports to total imports witnessed a decline from 9.4 percent during TE 1988 to 6.1 percent during TE 1994 but experienced a marginal increase to 7.5 percent during TE 2000. The value of agricultural imports decreased marginally from US$1.6 billion in TE 1988 to US$1.5 billion in TE 1994 and then shot up to US$3.6 billion in TE 2000. Owing to the sudden increase in imports, the actual value of agricultural imports in TE 2000 was 3.1 times the extrapolated trend value based on 1985-1994 imports. The overall outcome in terms of net agricultural trade was a slight drop in trade surplus from US$1.6 billion in TE 1994 to US$1.4 billion in TE 2000. In comparison with the extrapolated trend value for the period TE 2000 based on 1985-1994 trends in exports and imports, the decrease in trade surplus was quite high, about 54.9 percent. Net exports showed more or less positive growth from 1989 to 1996, barring the two years between 1992 and 1994 caused by an increase in imports (Figure 1). After 1996, there was a continuous decline in net agricultural exports for three years, 1997, 1998 and 1999, because of the fall in exports and increase in imports. Figure 1. Agricultural exports, imports and net exports. While the net trade balance of agricultural trade has been favourable all through the study period, there are significant year-to-year variations (Figure 2). 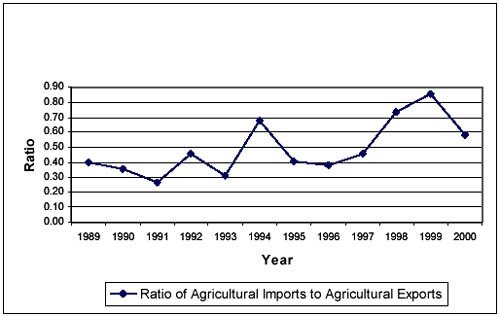 During the period from 1989 to 1993, the ratio of agricultural imports to agricultural exports remained below 0.5. In 1994, this ratio jumped to 0.68. It fell below 0.5 in 1995 and remained below this level in 1996 and 1997 as well. This ratio increased significantly in 1998 and 1999 but fell again in 2000. In general, the ratio of agricultural imports to agricultural exports during TE 2000 was about 1.49 times the value of this ratio during TE 1994. From the data shown in Table 7, both exports and, in particular, imports exhibit a greater stability, which is indicated by the drop in coefficient of variation during the second period as compared with the first period. However, the net trade balance has fluctuated widely during the second period, as reflected in the rise in coefficient of variation. Figure 2. Ratio of agricultural imports to agricultural exports. Source: Computed from FAOSTAT database. From these trends in overall exports, it appears that the 1991 economy-wide unilateral reforms, which reduced protection given to the manufacturing sector, introduced the convertibility of the rupee on the trade account and shaped a relatively more open export policy, have had a much greater impact on exports of agricultural products than the changes brought about by the liberalization of agricultural trade under the AoA. 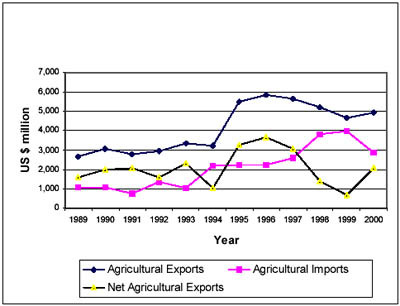 This is evident from the trends in the real effective exchange rate (Figure 3) and trends in agricultural exports during 1989-2000. The rising trend in exports was reversed in 1997, and exports continued to decline until 1999. The slowdown in exports during these years is due to several factors such as very little or no trade liberalization, and the significant decline in commodity prices and world trade during 1997, 1998 and 1999. These facts are also supported by the unilateral trade liberalization measures that have been taken during recent years, which are reflected in the trends in individual commodity exports of certain items discussed in the next section. Figure 3. 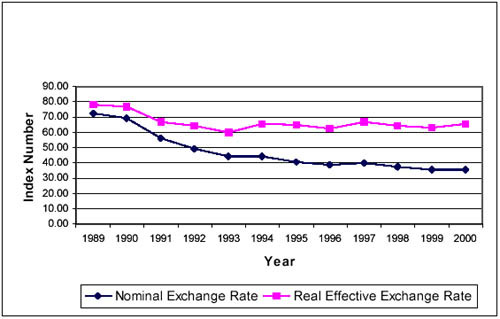 Trends in indices of nominal and effective exchange rate. The diverse trends in exports of various agricultural items witnessed during the study period have changed the export basket composition of agricultural products somewhat. For example, tea, which accounted for about 19 percent share of total agricultural exports during TE 1988, accounted for only 9 percent share of agricultural exports during TE 2000. This is despite the fact that the actual quantum of exports during TE 2000 was about 40 percent higher than the extrapolated volume for the same period based on the 1985-1994 trend (Table 8). Very similar changes were witnessed in the case of coffee as well. Likewise, exports of oilseed cakes, which witnessed a very high growth during the period between TE 1988 and TE 1994 (188 percent in quantum terms and 202 percent in value terms) exhibited a significant decline during the second period between TE 1994 and TE 2000. The actual level of exports of oilseed cakes in TE 2000 was 75 percent below the extrapolated value for the same period based on the 1985-1994 trend line. As a result, the share of oilseed cakes in total exports, which had increased from 9.2 percent in TE 1988 to about 20 percent in TE 1994, fell to 8.8 percent in TE 2000. This change in exports of oil cakes is due to unilateral trade policy changes. During the 1980s and the pre-AoA period, imports of edible oils were restricted, which provided higher incentives for domestic production of oilseeds. When imports of edible oils were liberalized in 1994, the output of oilseeds witnessed a slowdown after 1994, which had an impact on the production as well as exports of oil cakes. However, exports of rice, which accounted for a 9.3 percent share of total agricultural exports during TE 1988, improved its share to 19.5 percent during TE 2000. The level of rice exports increased by 126 percent between TE 1988 and TE 1994 and further by 275 percent between TE 1994 and TE 2000. The actual level of rice exports in TE 2000 was 70 percent higher than the extrapolated trend value. The fall in the unit value of rice exports is due to the change in the product mix of exports of rice. There are two main types of rice: basmati and non-basmati. The exports of nonbasmati rice were canalized through the Food Corporation of India. In early 1992, the liberalization of non-basmati rice exports was started by permitting exports of some superfine long-grain varieties, subject to a Minimum Export Price. In October 1994, export controls were lifted from all types of rice, including nonbasmati common rice varieties. These reforms paid rich dividends, which is evident from the remarkable increase in exports of rice. India emerged as the second-largest exporter of rice in 1995, after Thailand, which is the largest exporter of rice in the world (Sharma, 2001). Export of rice from India amounted to 4.9 million tonnes in 1995, comprising 4.5 million tonnes of non-basmati and 0.4 million tonnes of basmati rice, respectively. Rice exports were around 2.5 million tonnes between 1996 and 1997. In 1998 again, the quantity of rice exported, both basmati and non-basmati, touched 5 million tonnes. Exports of fruits and vegetables (excluding pulses), which account for about 16 percent share of agricultural exports, did not show evidence of any great changes. The average level of exports of fruits and vegetables in TE 2000 was only 23 percent higher than the level of exports in TE 1994 but was 7 percent below the extrapolated trend value for the period TE 2000. Almost similar changes were observed in the case of cashew exports. The exports of cashew nuts in TE 2000 were just 20 percent above the actual level of exports in TE 1994 but were 21 percent below the extrapolated trend value for the period TE 2000. In the case of spices, exports during the second period between TE 1994 and TE 2000 witnessed a higher growth than that between TE 1988 and TE 1994. This is reflected in the higher increase in the actual level of exports during TE 2000 over the TE 1994 value (48 percent) as compared with the lower growth recorded between TE 1988 and TE 1994 (30 percent). The increase in exports of other items such as meat and meat preparations and tobacco witnessed during the post-AoA period is also promising, but their share in agricultural exports remains low. In the case of cotton, another item in which the country has a comparative advantage, exports have traditionally been subject to quotas announced by the Commissioner of Textiles. Sometimes, exports are even forbidden if there are shortages in the domestic market. As a consequence of these controls, the cotton industry experiences considerable uncertainty as well as periodic shocks. This is reflected in the rise in the coefficient of variation during the second period. Thus, there are two main reasons for the rather subdued performance of Indian agricultural exports during the study period: first, constraints in the domestic market such as export restrictions and lack of consistency in export policy, which imparted an element of adhocism; second, the international trade environment, which remains quite restrictive and which is now discussed. First, an examination of the direction of exports of six major agricultural items shows that there are not many changes between TE 1994-1995 and TE 2000-2001, particularly in exports to developed country markets, barring a few exceptions. Second, there are problems of tariff peaks and tariff escalation, particularly in the case of non-traditional exports such as dairy products, fruits and vegetables, preparations of fruits and vegetables, meat and food industry products, which are emerging as promising products. Various studies show that despite national tariff reforms in most countries of the world, high rates of tariffs are still widespread (Table 9). Preparations of meat, fish, etc. Source: Gibson et al. (2001). Note: Tariffs are bound MFN rates based on final URAA implementation. Third, difficulties have been experienced with the administration of TRQs. It has been observed that minimum access opportunities were provided at the aggregate level, and these are normally distributed in such a way that they hurt domestic producers the least. In addition, there are problems in the allocation of TRQs because most of the time, these are allotted to traditional trading partners, effectively prohibiting the entry of products from other countries. The problems related to TRQs are posing great difficulties in exporting some of the new upcoming items such as mushrooms to the developed countries. These problems become more complicated because of commodity-specific preferential access arrangements, which are leftovers of past colonial history (Josling, 1998). These bilateral arrangements hinder exports from countries that are not part of the arrangement and are efficient producers. For example, in the case of floriculture, a number of countries such as Gambia, Kenya, Zambia and Zimbabwe benefit from preferences in the EU under the Lomé Convention (now the Cotonou Agreement). Likewise, exports from Colombia and Equador have preferential access in the EU. India had special preferential access for 10 000 tonnes of sugar in the EU market, but the 1995 agreement between the EU and India expired on 30 June 2001. Fourth, high export subsidies in developed countries continue to be a major constraint for efficient producers despite agreed reductions in export subsidies. Exports which are highly subsidized include dairy products, beef (including other meat), wheat, coarse cereals and sugar, which account for a little over 87 percent share of the total value of export subsidies for all commodities. Of this, dairy products alone account for about a 29 percent share. Because of high export subsidies on these products, a handful of countries are able to maintain their competitiveness at the expense of countries, such as India, which are not able to use export subsidies but are efficient producers of a wide variety of agricultural commodities. Indian exports that have been seriously impacted include cereals (wheat), dairy products and, to a certain extent, sugar. Fifth, domestic policies of the developed countries, which allow them to pay huge subsidies to their agriculture, help in reducing the fixed costs of farmers in developed countries. Further, since the basis of the AMS reduction is not commodity-specific, this allows countries to actually increase support for some products while still meeting reduction commitments. The majority of the products that are heavily subsidized by the developed countries directly compete with products that are of interest to countries such as India. Sixth, there is a large amount of discretion in the SPS Agreement. The aim of the agreement is to prevent member countries from using human, animal and plant health standards for protectionist purposes. Every country, however, has its own rules regarding these restrictions such as inspection of imported products, specific treatment or processing of products, fixing of maximum allowable levels of pesticide residues or permitted use of certain specific additives in food. These flexibilities in the SPS agreement leave considerable room for discretion. In addition, SPS standards are becoming increasingly complex. In the majority of developing countries, the required technology to carry out basic testing and certification is not available. The importance of such standards, and the difficulties that India has experienced during the implementation period, has already been discussed in the section on SPS standards. Imports of food products account for about 78 percent share of the countrys total agricultural imports, but exports of food products account for a lower share, around 56 percent, of total agricultural exports. As food trade accounts for the greater share of both agricultural exports and imports, the behaviour of food trade during the period of study is similar to the trends observed in agricultural trade (Table 10). The value of food imports fell slightly from US$1.4 billion in TE 1988 to US$1.1 billion in TE 1994, and then increased significantly to US$2.8 billion in TE 2000. 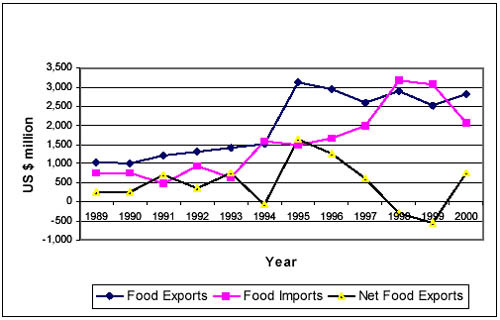 Owing to the rapid increase in food imports during the period between TE 1994 and TE 2000, the actual value of food imports in TE 2000 was 3.5 times the extrapolated trend value based on 1985-1994 imports. The value of food exports increased from about US$ 1 billion in TE 1988 to US$ 1.4 billion in TE 1994, and further to US$ 2.7 billion in TE 2000. Hence, as in the case of food imports, the exports of food also exhibited a higher growth during the period between TE 1994 and TE 2000 as compared with the growth recorded between TE 1988 and TE 1994. As a result of the higher growth in food exports during the post-AoA period, the actual value of food exports in TE 2000 was 48 percent higher than the extrapolated trend value based on 1985-1994 exports. As a consequence of relatively higher growth in food imports than with food exports, net food trade witnessed a reversal from a situation of surplus in TE 1994 of about US$355 million to a deficit of about US$23 million in TE 2000. The trends in yearly changes in net food exports indicate a significant increase in fluctuations, which is evident from Figure 4 and also in the considerable rise in the coefficient of variation during the period between 1995 and 2000 over the period between 1989 and 1994. On average, although the net balance in food trade remained favourable, there were three years during this period, 1994, 1998 and 1999, when the ratio of food imports to food exports was above unity implying an excess of food imports over food exports. The increase in food imports was largely due to the rise in imports of edible oils during 1998 and 1999. Figure 4. Food exports, imports and net exports. Edible oils are the only major import item, accounting for a little over 42 percent and 62 percent share of total agricultural imports during the periods TE 1988 and TE 2000, respectively. During the mid-1990s, the share of edible oils in imports declined to 13 percent. These dramatic changes in the imports of edible oils are due to unilateral trade policy reforms implemented in the oilseeds sector. In the 1980s and early 1990s, imports of edible oils remained canalized through the State Trading Corporation (STC) and Hindustan Vegetable Oils Corporation. Imports (mainly of palm oil) were managed so as to support domestic edible oil prices at levels far above world prices to increase oilseed prices and promote oilseed production in the interests of import substitution and self-sufficiency. Imports of pulses in TE 2000 were 26 percent lower than the level of imports in TE 1994. The extent of the decrease in imports of pulses was close to the level predicted by the extrapolated trend value. The share of imports of pulses has also decreased from 16.3 percent in TE 1994 to 4.7 percent in TE 2000. In March 1994, imports of palm oil were put under Open General Licence (OGL) at 65 percent import duty, while, at the same time, state agencies like STC and National Dairy Development Board were allowed to import palm oil at a lower duty of 20 percent. In February 1995, this initial liberalization was followed by a far more sweeping reform by which all edible oils except for coconut oil were put under OGL at an import duty of 30 percent. And in May 1999, the import of all types of oilseeds was liberalized and put under OGL at an import duty of 40 percent. Following these far-reaching changes in the edible oils sector, frequent changes have been made in the import duties from time to time, but imports have remained free (Sharma, 2001). These reforms in the edible oil sector and moderate import duties mark a clear break with past policies in the oilseed sector and explain the decrease in imports of edible oils during the six year period preceding the AoA and the sudden increase in imports thereafter. Among cereals and cereal preparations, wheat is the main import item, imports of which basically reflect occasional shortages. Imports of wheat accounted for about 8.6 percent share of the total value of food imports in TE 1988. Despite significantly higher growth in wheat imports during the period between TE 1994 and TE 2000, they accounted for only 5.6 percent share of food imports during TE 2000. In the 1960s and 1970s, wheat was a major item in the cereal imports of India. The dependence on imports diminished over time, as output levels grew and the country moved towards almost near self-sufficiency in cereals. As regards imports of sugar, the trend in imports basically reveals a situation of sporadic scarcity. There has not been a major change in the actual level of sugar imports between TE 1988 and TE 1994 or between TE 1994 and TE 2000. But, in comparison with the extrapolated trend value for the period TE 2000, actual imports are much higher. One of the major changes that occurred in the sugar sector after 1994 is the liberalization of sugar imports. Imports initially attracted a very low level of import duty, which has been revised several times and now stands at 60 percent. Imports of fruits and vegetables also remained restricted because of a general ban on consumer goods. There was no change in this policy until September 1998. When the prices of a few selected vegetables, such as onions and potato, rose unusually sharply, the import of onions and potatoes was put under OGL. As a part of the liberalization process, during the last three years (1999, 2000 and 2001), imports of a number of fruits and vegetables were put under OGL. The trends in imports of fruits and vegetables do not reveal significantly different changes between the period TE 1988-TE 1994 and TE 1994-TE 2000, particularly in quantum terms, although the changes are more significant in value terms mainly because of changes in the unit values of imports. The post-AoA period has also witnessed changes in the import policy of other products. Dairy products such as skimmed milk powder and butter oil were also freed in 1995, but their levels of imports remain very low. The term agricultural trade used here excludes exports of marine products. Details of these trends are available from the author.